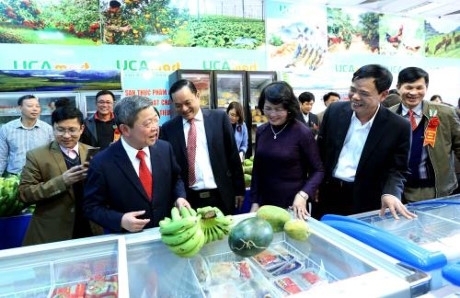 The Vietnam Co-operative Alliance (VCA) and Vietnam Safe Farm Product Co-operative Alliance opened the fifth safe agricultural products supermarket - UCAmart in Hanoi on February 13. The opening ceremony was attended by Vice President Dang Thi Ngoc Thinh, Minister of Agriculture and Rural Development Nguyen Xuan Cuong and Chairman of the VCA Vo Kim Cu, along with leaders of the Hanoi municipal People’s Committee, local co-operative alliances as well as 100 co-operatives and safe farm product businesses. Addressing the ceremony, Vice President Dang Thi Ngoc Thinh praised the initiative of the VCA in establishing the Vietnam Safe Farm Product Co-operative Alliance, which supplies safe farm products provided by over 100 agricultural co-operatives meeting safe agricultural and VietGap standards. She expressed hope that the supermarket chain for safe agricultural products – UCAmart would continue to expand its operations in the future. Customers can check the origin of products, expiry dates, transport process information through the bar codes on the packaging. Over the next 2 years, around 100 UCAmart supermarkets are scheduled to open in Hanoi and Ho Chi Minh City as collection and distribution centres for agricultural products. 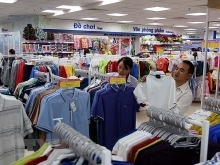 The opening of the supermarket chain not only helps provide people with safe agricultural products, but also builds a trademark for Vietnamese produce and food items.